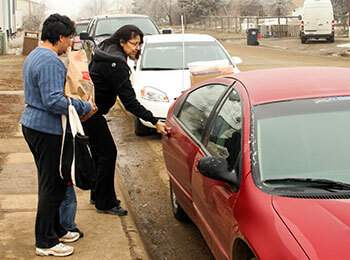 Advocates at Cheyenne River Indian Outreach provide transportation to court dates and other appointments. One of the greatest challenges of living in South Dakota is the sheer distance between towns … which also means distance between everyday services. A grocery store … a drug store … a hospital. Towns large enough to offer a grocery store, bank or hospital are few and far between on the reservations in South Dakota. Some of these tiny communities don’t even have a gas station. Eagle Butte, home to Cheyenne River Indian Outreach, is the largest town on the Cheyenne River Indian Reservation with a population of 1,318. 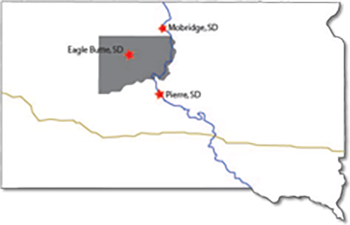 Dupree, the next largest community with just over 500 residents, is 20 miles from Eagle Butte with nothing in between. Timber Lake, the third largest town, has about 450 people and is 42 miles from Eagle Butte. The Cheyenne River Indian Reservation covers approximately as much area as the state of Connecticut. From there, numbers dwindle. Many communities in this area have 50 people or fewer. For women and children trying to find safety, Cheyenne River Indian Outreach is a vital resource. Pilamaya — thank you — for helping keep our doors open!